The 2014 Jeep Cherokee is highlighted by the 3.0-liter EcoDiesel V-6 engine, available for the 2014 model year. The EcoDiesel engine enables the 2014 Grand Cherokee to achieve up to 30 MPG on the highway, a driving range of 730 miles, and best-in-class towing capability of 7,400 pounds. The eight-speed transmission boosts fuel economy across all powertrains while enhancing 4X4 capability with a low crawl ratio. 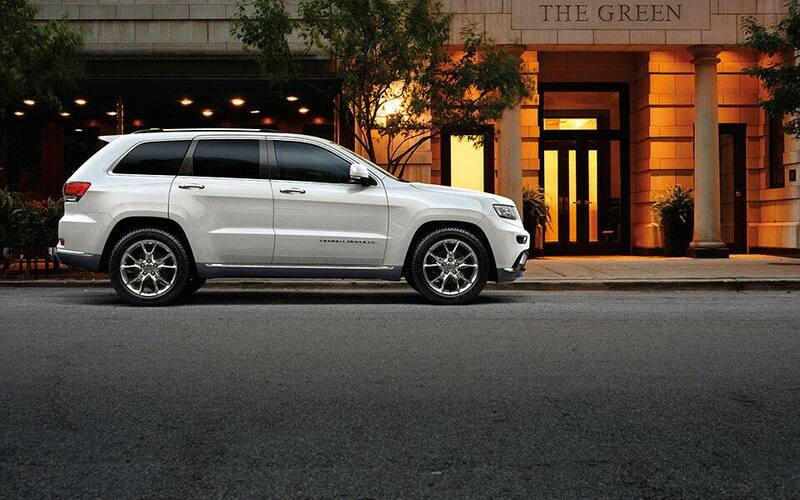 With over 60 safety and security features, the Jeep Grand Cherokee leads competitors in the category for 2014. With an available class-leading 240 horsepower and a massive 420 lb.-ft. of torque, Jeep's 24-valve dual-overhead cam 3.0-liter EcoDiesel V-6 delivers clean-diesel technology with low CO2 emissions. Capable of towing a best-in-class 7,400 pounds, the EcoDiesel-powered Jeep Grand Cherokee delivers 22 mpg city and 30 mpg highway in 4x2 models, resulting in a best-in-class driving range of more than 730 miles. Jeep Grand Cherokee's EcoDiesel engine, along with its V-6 and V-8 gas engine offerings, sends power through Chrysler Group's eight-speed automatic transmission, significantly improving fuel economy across the Grand Cherokee lineup. The flex-fuel V-6 delivers 290 horsepower and 260 lb.-ft. of torque, while the 5.7-liter V-8 packs 360 horsepower and 390 lb.-ft. of torque with best-in-class towing capacity of 7,400 pounds. When Jeep introduced the 2011 Grand Cherokee, it quickly impressed owners with its elegant, upscale design that was still able to convey the rugged capability one expects in a Jeep vehicle. For 2014, Jeep Grand Cherokee builds on this success, conveying an even higher level of elegance combined with strength. All trim levels of the 2014 Jeep Grand Cherokee have been given an even more premium look, while simultaneously making each trim level readily identifiable at a glance. 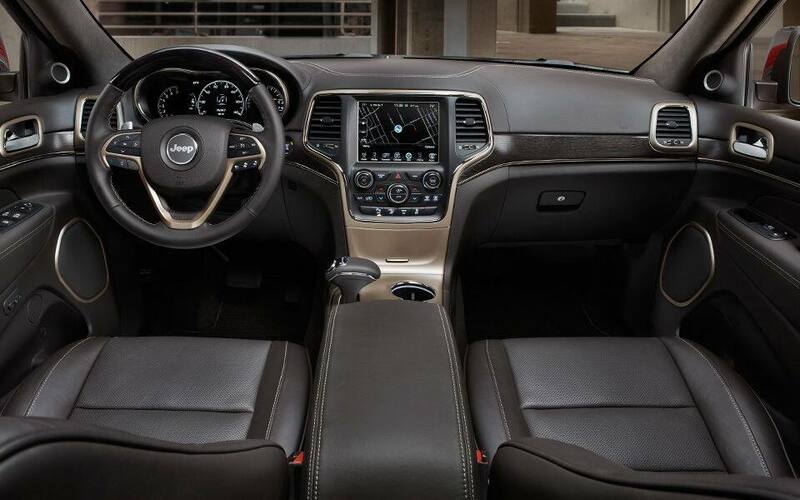 On the inside, the award-winning interior of the Jeep Grand Cherokee is clearly one of the most technically advanced, well-crafted interiors in the industry. Immediately noticeable is the revised center stack featuring a Uconnect 5-inch or 8.4-inch touchscreen interfaces. Controls for radio and climate are found below the screen and have easily identifiable knobs and buttons for easy access. The 2014 Jeep Grand Cherokee completely redefined the premium SUV for 2014, delivering consumers an unprecedented combination of best-in-class fuel economy and driving range, available clean-diesel technology, a choice of leading powertrain options, legendary benchmark capability, world-class craftsmanship, premium on-road driving dynamics, and a wide variety of advanced user-friendly technology and safety features. The 3.0-liter EcoDiesel V-6 boasts an unsurpassed driving range of more than 730 miles. For more information about the 2014 Grand Cherokee or to test-drive one, call us today!